Mama Nibbles: Monsters University in Theaters NOW! Monsters University in Theaters NOW! 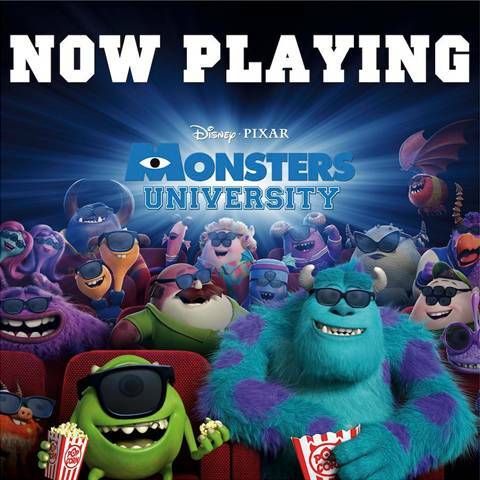 Disney PIXAR Monsters University movie is in theaters now! I took my 7 year old son to see Monsters University in 3D the other day and he loved it! Usually he can't sit through a movie that is more than an hour long. Monsters University is 110 minutes long. The story of Mike and Sully attending Monsters University is heartwarming and hilarious. We were on the edge of our seats. I don't think I've ever laughed or smiled so much during a movie before! I am so happy that Pixar created this prequel, it really helped us get to know the Monsters Inc. characters so much better. When Mike and Sully perform in the Scare Games that's when it really gets funny! At one point the whole theater audience exploded into cheers and laughter. The next moment you could cut the tension in the air with a knife. The story pulls you in, the action is exciting and funny, and a lesson is learned from this portion of the story which is not to cheat. A great lesson for everyone.